Zoey’s summer is going to be busy—but can she survive it without blogging? Includes “Sew Zoey” blog posts and fashion illustrations. In the seventh book in the Sew Zoey series, it’s almost summer vacation, and Zoey Webber won’t exactly be taking it easy. 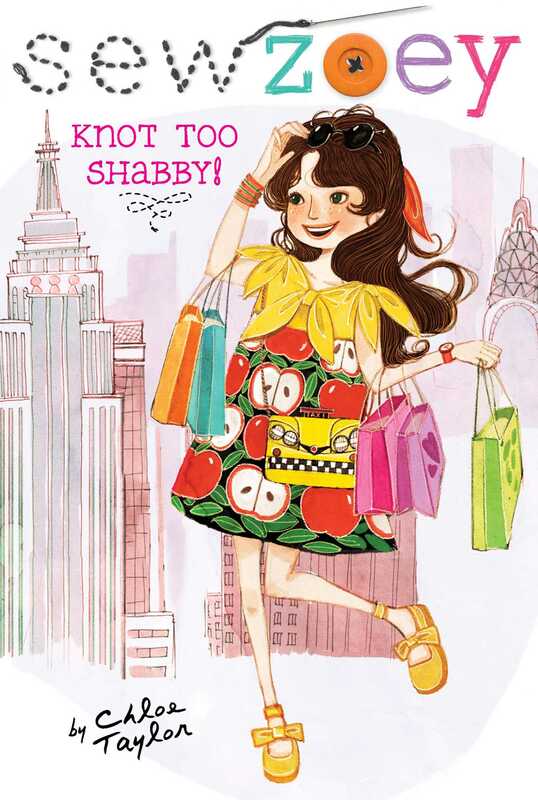 First she’s going to New York to meet her favorite fashion designer and spend the day at her design studio. Then she’s staying for an action-packed weekend in the city that never sleeps. And the fun doesn’t stop there: she and her friend Priti are going to sleepaway camp for the first time! The camp has canoeing, crafts…and a “no technology” rule. How will Zoey survive six weeks without sewing and blogging? I can’t believe how fast this school year has flown by! Summer vacation is just around the corner, and so far I’m planning on spending as much time as possible at Camp Lulu and the pool. It seems like only yesterday I got the text message from Priti, just before school started, telling me that our new principal, Ms. Austen, ended the uniform policy and made my dreams come true. I still get excited, just thinking about it. Yay, Ms. Austen! But so much has happened since then. I started my Sew Zoey blog, thinking only my family and a few friends would read it, or maybe no one at all. But it really took off, and through my blog I’ve “met” all of you awesometastic readers and learned so much from you. Sew Zoey has led to things I wouldn’t have imagined in my wildest dreams, like being picked for a Très Chic website feature and starting online shops for dog (and human) clothes! I won’t pretend it’s all been fun and games. Sometimes it’s been a teensy bit overwhelming. And that, my friends, is the understatement of the century. But I wouldn’t trade this year for anything. I can’t wait to see what new adventures this summer will bring! I just hope it involves plenty of fun in the sun at the beach, which happened to have inspired this sketch. Zoey loved getting her yearbook too, but she wasn’t sure she’d go as far as saying it was her favorite day of the school year. “I’m always afraid that there won’t be any pictures of me or that there will be a picture of me but an awful one,” Zoey said. Ms. Brown handed Kate her book and checked off her name against her list. They didn’t have long to look through their yearbooks before Ms. Brown started class—only as long as it took her to give out the rest of the books to the students. “You mean from the Sadie Hawkins dance?” Zoey asked. It wasn’t until lunchtime that Zoey and her friends had the time to really check out the yearbook. “Oh my gosh, Zoey. Did you see you were voted Best Dressed?” Libby Flynn exclaimed. “No way! What page? Show me!” Zoey shrieked. Libby passed her yearbook to Zoey, opened to the awards section. Sure enough, there were several pictures of Zoey wearing her own homemade fashion creations. “I can’t believe it!” Zoey said. “Entertaining? Moi? Really?” Priti said, waving her hands in a dramatic gesture. Zoey passed Priti her yearbook so she could see the picture of herself wearing a glittery headband, with jazz hands and a big smile. “It’s probably still getting engraved.” Zoey played along. “Kate, you’ve been voted Most Likely to Win Olympic Gold!” Libby said, still flipping through the yearbook pages. There were several pictures of Kate—playing soccer and on the swim team. “Okay, okay, I own it,” Kate said. “Say ‘I am the bomb,’ ” Priti instructed. “Do I have to?” Kate sighed. Zoey agreed with Priti too. Kate sighed again. “Oooookay. I’mthebomb. Satisfied?” Kate said. “It’s a start, but next time, say it like you really mean it,” Priti said. They all flipped through the awards pages. Sadly, Libby hadn’t been voted “best” anything. “My favorite picture in the whole yearbook is the one of all four of us together,” Kate said, turning to the picture of the four girls at the dance, wearing their tiaras. “That’s my favorite, too,” Libby said. That night before dinner, Zoey’s dad said he had some good news for Zoey. Zoey was always up for good news. “Who is Erica Hill, and what visit?” she asked. “Huh? I can’t hear you. Um . . . I think you just broke my eardrums,” Marcus, Zoey’s older brother, complained. “Negative five is being way too hard on yourself, Dad. I’d have said you were at least a three. I’d even go as high as a four or a five when you aren’t wearing sweats,” Zoey joked. “Yes! I’d be happy to be your fashion adviser,” Zoey said, giving her father another hug. It was really kind of cute when he admitted he was prone to making fashion faux pas. She couldn’t wait to take him shopping! Later that night, Marcus and his band were practicing in the basement. Mr. Webber ordered them pizza for dinner so that he and Zoey could get an early start at the mall. It began raining as they headed to the car. “You can have your pick of the food court,” Dad said as they pulled out of the garage. Rain pelted down on the roof of the car so hard that Zoey almost had to shout to be heard. Sure enough, by the time they got to the mall, the rain had lightened to a drizzle and the setting sun was trying to peek its way through the clouds on the horizon. “Look, Dad, a rainbow!” Zoey exclaimed. “If I have much more good luck, I might explode from excitement,” Zoey said. Zoey wasn’t sure if shopping for her dad was going to be as much fun as shopping for herself and her friends, but giving him a makeover turned out to be really fun. Like when he went for his favorite style of pants and shirts and she took them out of his hands and put them right back. Instead, she made him try on some straight-leg black jeans, a button-down shirt with a bold stripe, and a sleek blazer. When he came out of the dressing room, she clapped. Mr. Webber checked himself out in the mirror. Her father smiled at her in the mirror. By the time they walked out of the store, Mr. Webber had a complete Zoey-approved outfit from top to toe. Zoey even picked out some new dress socks with a subtle pattern. Zoey picked a popular burger place she knew her dad liked too. “Zo, I need to ask you something,” he said. Zoey fiddled with the straw in her water glass, hoping it wasn’t going to be something awkward. Her father looked surprised, but Zoey could tell he was also relieved. “Yeah. I mean, I know fashion isn’t your thing, exactly,” Zoey started. “That’s putting it mildly.” Dad laughed. For a moment, Zoey thought her dad was going to get all mushy, as he sometimes did when Zoey talked about her mom, who passed away when Zoey was a toddler. But he just smiled, took her hand, and squeezed it tight. Book Cover Image (jpg): Knot Too Shabby!